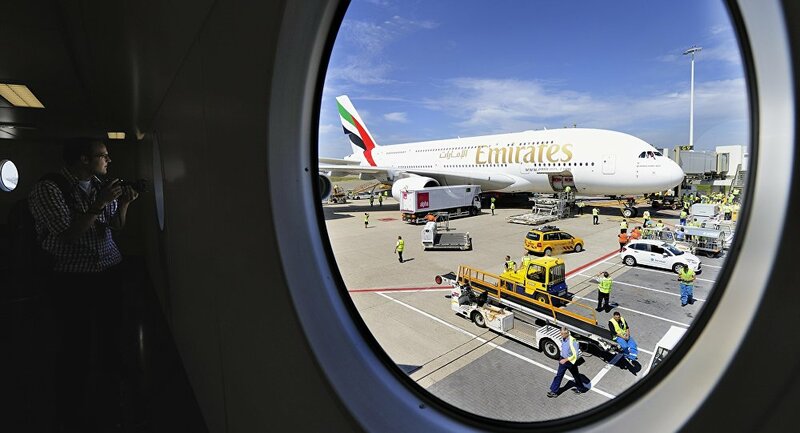 The Emirates airline is due to upgrade one of its two daily flights connecting Dubai and Moscow to an Airbus А380-800, the world's largest passenger plane, starting from December 1, the airline said Tuesday. MOSCOW (Sputnik) — The Dubai-based airline has served almost 3.5 million passengers since it began its Russian operations 13 years ago. Emirates transported about 400,000 passengers over the last twelve months due to an increase in demand for the Dubai-Moscow route. "Starting from 1st December 2016, Moscow will join more than 40 Emirates A380 destination cities across the globe. One of the two daily Emirates flights servicing the Dubai-Moscow route will be upgraded to an A380-800, and will be the only scheduled A380 service into Domodedovo [airport in Moscow]," the airline said on its official Facebook account. The Airbus A380 is a double-deck four-engine jet airliner that needs special airport facilities to operate. It can provide seating for up to 853 passengers and can fly 15,700 kilometers (9,755 miles) non-stop.